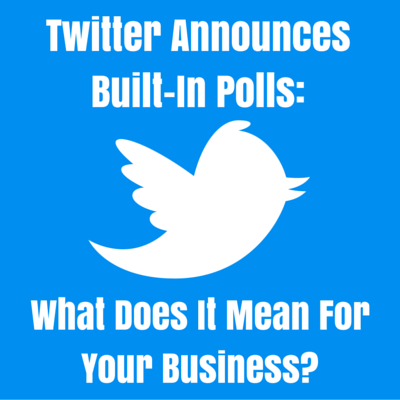 Twitter Announces Built-In Polls: What Does It Mean For Your Business? Twitter recently announced a new feature that we know your business will be really excited about. This new feature is built-in polls. In the coming days all Twitter users will be able to easily add polls to their tweets in order to get answers to questions, big and small. It is very clear that Twitter is making a significant effort to improve their product and the re-hiring of former co-founder and now CEO, Jack Dorsey, is an encouraging sign. We predict that this is only the beginning for Twitter Polls and that new, more robust, functionality will be coming in the next few months. A few of the things we hope to see are: more than 2 answer choices, the ability to control the duration of the poll and ways to highly target polls to relevant Twitter users (paid advertising). We are extremely excited about this new feature and plan to test it out in the coming weeks. Now it is your turn! What do you think of this announcement? How do you plan to take advantage of Twitter Polls? Let us know in the comment section below.